Lisa McGee's Bafta-nominated comedy, Derry Girls, is set to return to Channel 4 for a third series. McGee, who used her own childhood as the basis for the show, said she was thrilled her band of "eejits" would continue their on-screen adventures. The series two finale saw pretty much the entire cast going crazy for the visit of then-US President Bill Clinton - with the leading girls hoping to get close to his daughter Chelsea - while James got a surprise and Granda Joe embarked on a mysterious plan. 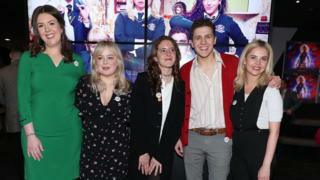 The Irish Times said the series two finale was "a moving and significant piece of nostalgia". The Telegraph (behind a pay wall) described it as "a terrific sign-off for a moving and uproariously funny show". And, without giving too much away, The Metro wrote that the last show "gives James centre stage in [a] perfect and poignant send-off". The first season, which also topped a Radio Times Comedy poll in August, is up for best scripted comedy at next month's British Academy Television Awards.